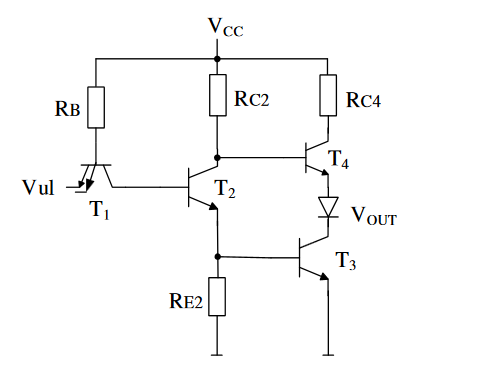 Find input voltage Vul and base voltage of T1, so that T1 enters full reverse active mode. Explain. Voltage base-emitter of BJT (when it conducts) is 0.7V, voltage base-emitter in saturation is 0.8V and voltage collector-emitter in saturation equals 0.1V. For BJT to work in forward active mode, EBJ should be forward biased (Vbe = 0.7V) and CBJ should be reverse biased (Vbc < 0.4V). For BJT to work in inverse active mode, EBJ should be reverse biased and CBJ should be forward biased. Does it mean that in this case Vbe = -0.7V and Vbc > 0.4V, for BJT on left side on image below? Does BJT in this mode behave like one on right side on same image? I know that in this mode, we have small gain Beta_reverse. Browse other questions tagged bjt reverse mode or ask your own question. NPN transistor circuit connection, what determines which region it is at? Saturation current in Ebers-Moll equations for BJT: what is it and how to measure it?